SpaceX's Falcon 9 rocket can be seen at Launch Complex 40 at Cape Canaveral Air Force Station in Florida on Dec. 6. A rocket engine nozzle concern has delayed the maiden test launch of a new private space capsule to later this week, NASA and the spacecraft's builder said. This story has been updated at 9:05 a.m. EST on Dec. 8. CAPE CANAVERAL, Fla. ? The private spaceflight company SpaceX has aborted its firstattempt to launch the Dragon commercial space capsule on its inaugural testflight this morning. The abort occurred just under three minutes before thescheduled launch at 9:06 a.m. EST (1406 GMT). The next attempt could take placeat 10:38 a.m. EST (1538 GMT), SpaceX officials said. "We did have an abort in the terminal countdownsequence," said SpaceX's John Insprucker, Falcon 9 rocket productdirector, during commentary. "We're evaluating what the abort conditionwas." 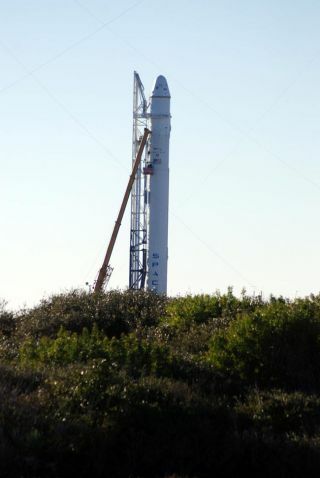 The company's Falcon 9 rocket and Dragonspace capsule are set to lift off from the Cape Canaveral Air ForceStation's Launch Complex 40 here in Florida. SpaceX has two remaining opportunities to launch the Dragon spacecraft today. The first window opens at 10:38 a.m. EST (1538 GMT) and lasts five minutes. The second is a four-minute window that opens at 12:16 p.m. EST (1716 GMT), Insprucker said. The test flight of SpaceX's Dragon spacecraft was originallyplanned for Dec. 7, but the launchwas delayed after two cracks were found in the aft end of thesecond-stage engine nozzle extension of the Falcon 9 rocket. The Hawthorne, Calif.-based SpaceX, short for SpaceExploration Technologies, was foundedby millionaire Elon Musk, co-founder of the PayPal online payment systemand CEO of the Tesla electric car company. For tomorrow's demonstration flight, the Falcon 9 rocketwill carry the Dragonspace capsule into low-Earth orbit. The capsule will then separatefrom the rocket's second stage and between two and three orbits of the Earth,demonstrating its operational communications, navigation and maneuveringabilities. The spaceship will then re-enter the Earth's atmosphere andland in the Pacific Ocean to be recovered by a ship. The target splashdown areais about 500 miles (nearly 805 km) west of Mexico, SpaceX officials said. Thefull duration of the test flight is expected to last approximately 3 1/2 hours,they added. "When Dragon returns, whether on this mission or afuture one, it will herald the dawn of an incredibly exciting new era in spacetravel," Musk said in a statement. "This will be the first newAmerican human-capable spacecraft to travel to orbit and back since the SpaceShuttle took flight three decades ago." SpaceX has reportedly spent about $600 million to date onits Dragon and Falcon rocket programs since Musk founded the company in 2002. That investment has netted SpaceX a $1.6 billion contractwith NASA to use its Dragon spacecraft for cargo flights to the InternationalSpace Station following the retirement of the agency's space shuttle fleet nextyear. SpaceX plans to fly at least 12 unmanned Dragon missions through 2016 todeliver supplies to the space station. The Dragon space capsules are named after Puff the MagicDragon, since many critics considered it to be impossible, SpaceX officialshave said. SpaceX's Falcon 9 and smaller Falcon 1 rockets are named after theMillennium Falcon, the fictional "Star Wars" spaceship of choice forthe character Han Solo. If successful, SpaceX will be the first commercial companyto launch and re-enter a spacecraft from low-Earth orbit. The mission is alsoSpaceX's second launch of its two-stage Falcon rocket. The first Falcon 9rocket launched on a successful test flight in mid-June. "This is an extremely exciting milestone for both NASAand SpaceX," said Phil McAlister, acting director of commercial spaceflight development at NASA Headquarters in Washington, D.C. "We've got anextremely challenging year ahead with the remaining milestones, but gettingthis far this fast has been a remarkable achievement." The test flight will also be the first by any company underNASA's Commercial Orbital Transportation Services (COTS) program, which isdesigned to stimulate the development of privatespace vehicles capable of carrying cargo and crew to the InternationalSpace Station. "[NASA has] been a fantastic customer for us,"said Gwynne Shotwell, president of SpaceX, in a prelaunch news briefing Monday. "The relationship has been extraordinary, and both teams have learned alot." SpaceX's $1.6 billion space station cargo contract with NASAis separate from its COTS deal, which offers $278 million for successfuldemonstration tests of hardware capable of space station deliveries. NASA has also awarded another cargo contract to theVirginia-based company Orbital Sciences to provide robotic delivery ships forthe space station. That deal promises Orbital Sciences $1.9 billion for eightcargo flights using its new unmanned Cygnus spacecraft and Taurus 2 rockets. SpaceX also hopes to win a contract to one day ferryastronauts to the station ? though the Dragon capsule is not yet certified tocarry human passengers into space. You can follow SPACE.com Staff Writer Denise Chow onTwitter @denisechow. Visit SPACE.com for completecoverage of SpaceX's debut Dragon spacecraft launch.